There are times when our long lingering winters get to me more than others. When that happens, I look for something light and fresh to eat so I can fool myself into thinking that spring really is just around the corner. I put this dish together last April, after one of the worst winters I can remember in Chicago. We still had winter conditions and it seemed that spring would never come. So I made this chicken and broccoli stirfry for dinner and - lo and behold! - spring arrived the very next day. As if. But it did help me feel better. And now that we are once again in the throes of what seems like a never-ending (and is indeed a record-breaking) winter, I plan to make me a stirfry tonight and see if I can't work that magic again. Maybe if we all stirfry tonight spring really will come tomorrow. I know. Sigh. But I'll be happier regardless. Fill a three-quart saucepan with water and bring it to a boil. Add the broccoli florets. Turn off the heat, cover them immediately and let the pan sit for four minutes. Drain and rinse under cold water, then set aside. Cut chicken into 1-inch pieces, keeping the size as uniform as possible. Place in a small bowl and sprinkle with one tablespoon of the cornstarch. Set aside. Combine the sherry, soy sauce, and rice vinegar in a small bowl and set aside. In a smaller bowl, combine a tablespoon of cornstarch with a tablespoon of water and stir to make a slurry. When all of the ingredients are ready, place a wok over high heat and let it sit until smoke begins to rise from the bottom. Add 1 tablespoon of the peanut oil and swirl around to evenly coat, then add the chicken. Cook, stirring continuously, until the chicken pieces are cooked, 3 to 5 minutes. Remove the chicken and set aside. Add the remaining peanut oil to the wok, then the garlic/ginger paste. 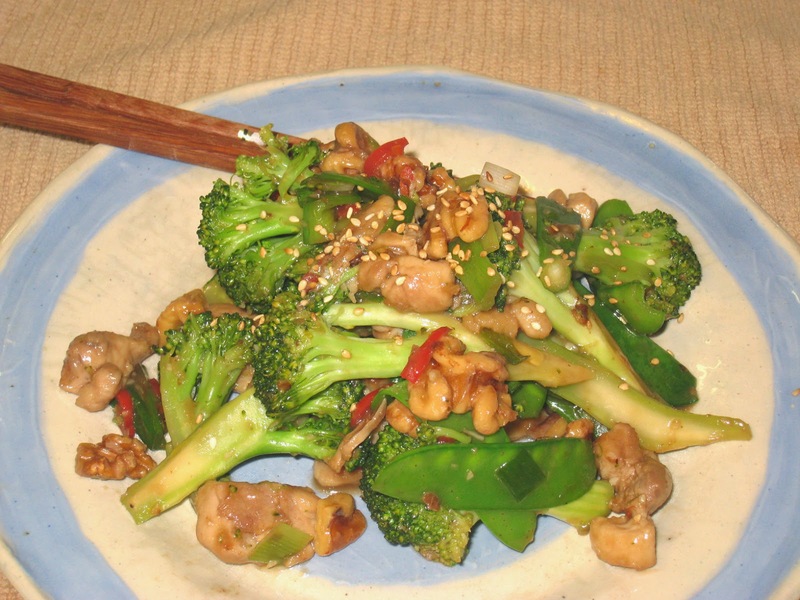 Stir for a few seconds and then add the broccoli. Stirfry for 2 to 3 few minutes. Add the snow peas and stirfry for a minute more, then add the white parts of the green onions and the fresno chili and stirfry one more minute. Add the chicken back into the wok and stirfry for another minute. Add the walnuts, then pour in the sherry, soy sauce and vinegar mixture and cook until the liquid is boiling. Add the cornstarch slurry and stirfry until the liquid has thickened to the desired consistency. Remove the wok from the heat and add the sesame oil, sesame seeds and the tops of the green onions. Serve immediately.